Labour Day originates in the labour union movements of the 1800s as a way to celebrate the social and economic advancements and to pay tribute to the driving force of our economy. The history of Labour Day continued to be connected with organized labour. Initially, the first unofficial “Labour Days” in Canada were actually protests against a law that made it a crime to be a member of a union. In 1872, this law was abolished, but various union protests and parades continued, and there was pressure to make Labour Day a national holiday. In 1894, the federal government declared Labour Day a national day of recognition for workers across the country. This year, Labour Day falls on Monday September 2, 2013. All provinces and territories observe this holiday. Government bodies and agencies as well as many businesses are closed on Labour Day. Employees are given a day off with regular pay or public holiday pay (depending on the province or territory of employment). 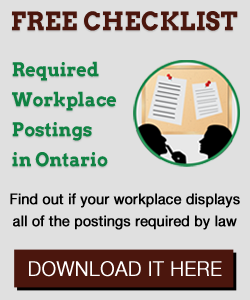 If the employee is required to work on the holiday, the employee must be paid regular wages and get a substituted day off with pay at a later date (depending on the province or territory). For specific requirements for your jurisdiction, consult the Library section of HRinfodesk. We should also note that Labour Day is also celebrated in other countries. Labour Day is an occasion to campaign for and celebrate workers’ rights during parades and picnics organized by trade unions. Happy Labour Day! Enjoy your day off, and the last long weekend of the summer.